Cornbread cupcakes were a breeze using this Post Punk Kitchen recipe. I really wanted to make pink frosting for cupcakes, however I had a number of friends attempt to dissuade me. 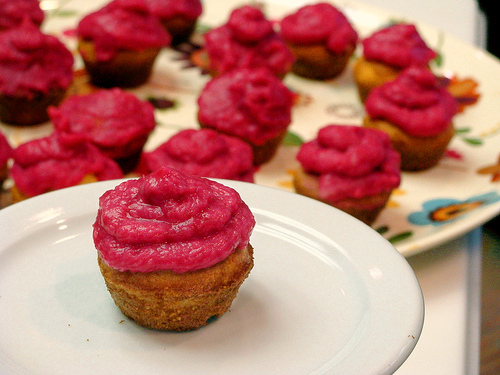 I got a little overzealous and ended up with fushia cupcakes. While they were delicious, the color really turned off many of the diners--except Belle who ate many many. I was still wiping pink off of her this morning. Whoa, quite the spread you showcased here...I like the word "skullduggery" and the beet hummus cups, real eye catcher!